Little squishy Flubber-like aliens! If that doesn’t endear you to EcoSoft’s game app, Spaliens, I don’t know what will. Probably not the fact that it’s another match-three game, which you can find every which way you turn in the Appstore. But these cute little aliens need help, for their planet is in danger of exploding, and you need to help them get off it. To do this, you need to match three Spaliens of the same color by launching them at each other. Tap the space on the screen you want their little bubble to go, and don’t forget that you can bounce them off of the walls as well. If you connect three or more of them together, they will be teleported to their mothership. You receive stardust points for every successful teleport; the more Spaliens saved, the higher your score. After five matches, you get a special Teleport Combo to help you save more Spaliens and raise your score; with every 100,000 points, you earn an extra life. There are 40 different levels and three difficulty types to this game. And surprise–there’s a bonus round after passing every level. In terms of graphics, the Spaliens are done quite well–I enjoy watching all their little antics, especially when I haven’t touched the screen in a while. Alien they may be, but certainly cute as a button. The sound effects only serve to heighten that aspect, what with all the little squeaks and pops. The soundtrack to the Help menu is actually quite evocative…I wouldn’t mind having it played for the actual game. The vague 70s theme is also rather creative, and the gameplay is definitely easier than other launch-and-match-three games on the market. The one thing glaringly wrong is that there is no autosave function: pausing and aborting the game will send me right back to the beginning, which is a huge waste of my time. For $0.99, this game is adorable to look at and play with, but unless an autosave function is enabled, not really worth a try. [UPDATE] There is actually an auto-save function, surprise! Ignore the last two sentences of this review, good people. 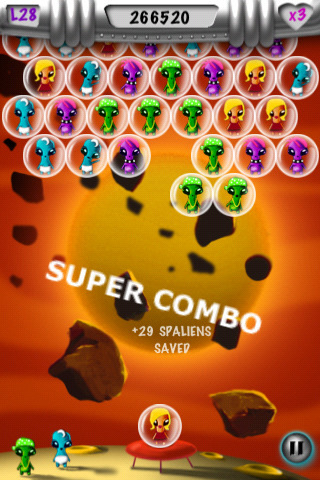 AppSafari review of Spaliens was written by Julie Guan on May 13th, 2010 and categorized under App Store, Fun, Games, Mini Games, Physics Based, Puzzler, Strategy. Page viewed 4756 times, 1 so far today. Need help on using these apps? Please read the Help Page. The auto-save option is enabled – you can quit the game at any time, and on return you can resume from the exact same point. i actually bought the game, and there is an auto save. you should correct your review. liked it – cool graphics! i really think that you should update your review, since there IS auto-save.